Discussion in 'Transformers Feedback & Reviews' started by Philister, Jul 22, 2010. The chest right (robot side) chest gun is loose on mine, but the visor's fine. I'm surprised just how much I like this deco. It's completely garish and clashes horribly. But the ample black somehow grounds the scheme, and instead makes it simply eyecatching and quite attractive. I think it's my favourite version of the mold, in terms of colours. Good, intelligent well reasoned review. Still hate the figure though, never liked the mold and while I love the colour scheme, it really doesn't fit the theme of this years Botcon. I love me some G2 and I love Classics repainted as G2, this just didn't work for me. Didn't like the mold way back when either. Still, QC problems can be overlooked for how great the colors and mold are. Mine also has loose chest guns, loose visor, and mine had one of the mandibles missing from its alt mode (I got it replaced, though). Aside from that, it's an excellent paint job; I love the bright colors mixed with the black and dark transparent blue. This is my second favorite Botcon exclusive, second only to Clench from this year's box set. I think it's a great homage! cool review but not for me. i hope it's not frowned upon but i got one sealed with biocard from botcon im looking to get rid of. holler back. Got mine last week. Love him. Always was a fan of the original (I even own a prototype of him). FP managed to map out the deco really well. Think he's my favorite Botcon repaint yet. I really love this figure. not the most poseable mold, but great for the figure it's supposed to be. Nice review, I haven't been able to bring myself to open him yet (still on the fence about selling him), but the pics are making it tempting. Just can't decide if it fits anywhere in my collection. 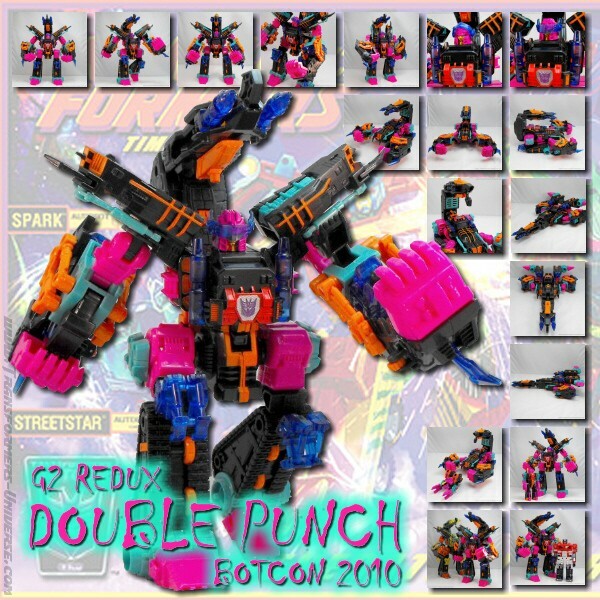 Are there electronics in BotCon 2010 Double Punch?